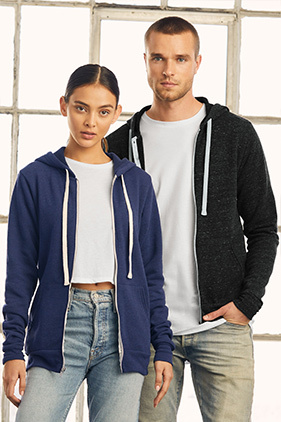 An incredibly soft sponge fleece and relaxed unisex style for that already lived-in feel. 50% polyester/37.5% Airlume combed and ring-spun cotton/12.5% rayon, 32 single 8.2 ounce triblend sponge fleece fabrication. Pre-laundered, relaxed retail fit. Natural draw cord, zip front and kangaroo pocket. Sideseamed. Unisex sizing. Rib cuffs and waistband.